Just a bunch of heathens. All current photos by Craig Brayton. 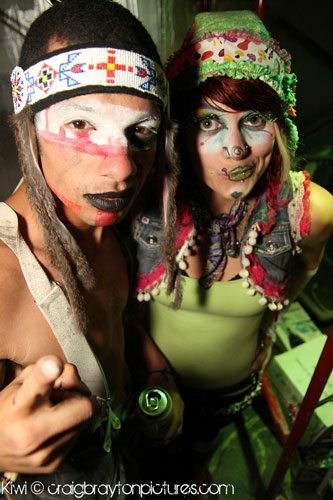 When Ocean Beach’s Heathens raise funds, they do it with style. On a recent Saturday night, the OB-based group of artists, street performers and other free spirits welcomed 150 people to a warehouse in Barrio Logan. The night’s activities alternated back and forth between DJ-driven dance sessions and performance pieces featuring select members of the group. Escape from Heathens Island was the name given the night’s festivities. 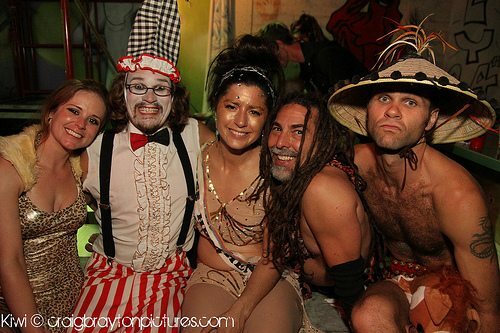 Most guests wore costumes, the theme seeming to be a psychedelic blend of pirate and clown, with some tribal flavor tossed in. 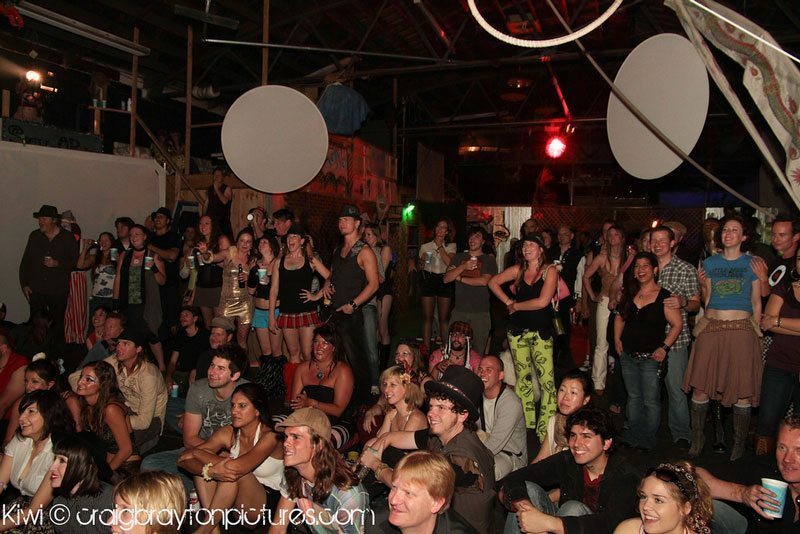 The crowd at the secret warehouse. Early in the evening, a young man took to the stage to juggle swords. Later, a young woman twisted and spun through an acrobatic regimen on a rope suspended from the warehouse’s roof. Other performances included a bull-and-matador routine, a dance-off featuring two strapping dudes in short shorts, and a puppet show on an overhead projector. In the breaks between performances, the DJ brought up the house music and the crowd brought out the dance moves. 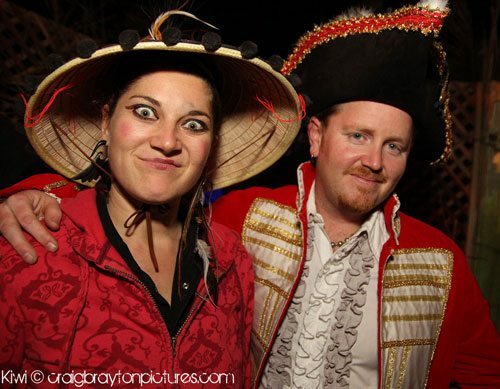 At one point, Taz, the guy in the Pirates of Penzance outfit who had taken our $15 donations at the door, strode on to the dance floor on a pair of stilts, doing a couple laps and reaching down for high-fives before settling in to groove to the beats. The day after the fundraiser, I returned to the warehouse to interview Derrick and Randolph, two Heathens who helped organize the party and performed in it. They described Escape from Heathens Island as a big success. “Last night was beautiful,” Derrick said. Derrick is half of Mango and Dango, a performance duo he formed with Megan Fontaine — aka Miss Mango — in 2002. 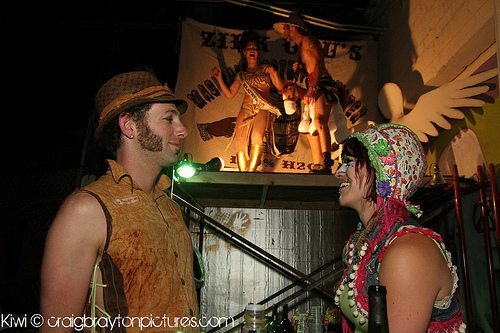 The pair specializes in “theatrical circus vignettes” and has entertained audiences in settings ranging from schools and charity functions to street theater festivals and night clubs. Their bag of tricks includes stilts, aerial hoops, dance, comedy, and much more. “I like to hoop dance like nobody’s business,” says Miss Mango on her MySpace page. Mango and Dango — along with some of the other Heathens from Brighton Avenue — are members of Zirk Ubu, a collective of acrobats, fire-spinners, jugglers, and other entertainers that calls itself “part circus and part mystery cult.” The warehouse that we partied in the night before serves as Zirk Ubu‘s practice area and storage space. Derrick grew animated as we talked about the fundraiser’s beneficiary: a July 24th Heathens event at Dusty Rhodes Park. Citing the Willy Street Fair in Madison, Wisconsin as an inspiration, Derrick said the Heathens are putting together an assortment of live music, dance, and other performances, sculpture and other art, for Ocean Beach residents of all ages. Ideally, as the sun sets on July 24th, the Dusty Rhodes Park event will culminate in a procession to the sands of Ocean Beach, where the group hopes to build a bonfire. Randolph is confident that the Heathens will obtain the necessary permits — and he also hopes to work constructively with the police, as well. “We’ve been trying to avoid as much conflict as we could,” he said. 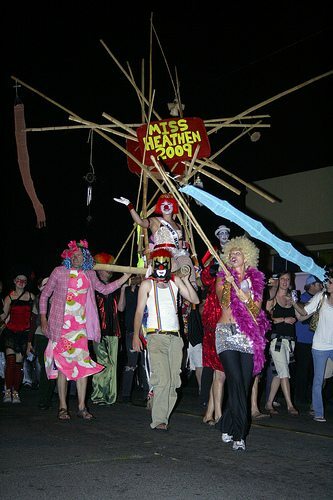 Heathen procession through OB - May 2009. This will be the Heathens’ ninth annual procession through OB. The first was in 2002, with 30 or 40 participants. Most years, the police have watched the group from its periphery and allowed it to do its thing. In 2005, however, the police broke things up when the procession turned into a stationary dance party at the intersection of Newport and Bacon. Police also cut things off last year, shutting down the bonfire by threatening participants with arrest. In the wake of last year’s sour finish, Randolph talked to one of the leaders of the SDPD team. “Her expression to us was we caught them by surprise. They didn’t know what was going on.” Accordingly, Randolph hopes to avoid friction this year by giving the police a thorough heads-up on the event. Awesome write-up, thanks Shane! I’m gonna have to check out one of these Zirk Ubu events for myself sometime…I’ve been lucky enough to catch the midnight parades completely by chance twice in the last few years, definitely an interesting spectacle. Both, sucka! But at least one relationship is in jeopardy…we needs a cheaper apartment, stat! Randolph reports that the officer’s friendly approach generated palpable goodwill among the crowd and the cops, and indeed, the event proceeded smoothly. Where can I connect with the Heathens? I’ve been to a few of the parties and parades, but I’d like to connect with the group intentionally :) FB? Tribe? Something? Look for Miscellaneous Heathens of Ocean Beach on FB – tho actually reaching anyone via this route may be equivalent to taking a bike ride with Samuel Beckett! Better to chat someone up at a Zirk Ubu event, also posted on FB & other places where eminent spectacles are forecast.